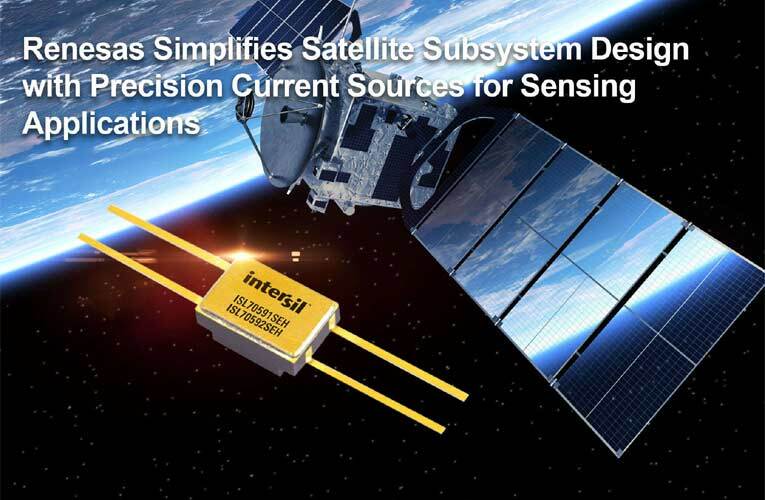 Renesas Electronics released two new radiation-hardened precision current source ICs - ISL70591SEH and ISL70592SEH, designed to provide current excitation to the more than 300 resistive sensors that monitor the health of a satellite’s subsystems. These devices are the first current source ICs in Renesas’ line of space products, and are ideally suited for telemetry, tracking & command, attitude & orbital control, and electrical power subsystem applications. The ISL70591SEH and ISL70592SEH come in 4-lead ceramic flatpack packages and provide 100µA and 1mA of output current, respectively. With a smaller footprint, they can replace the discrete solutions which typically require three to five components. Moreover, the smaller package size boosts reliability by placing the excitation source closer to the sensor. The ICs also reduce system errors by delivering ultra-low noise for higher accuracy over temperature and radiation. Their high output impedance rejects voltage variations on the supply line, and lets designers parallel multiple current sources if they need higher current. These devices deliver ultra-high performance in the most demanding environments by leveraging Renesas’ proprietary silicon on insulator process, which provides single event latch-up (SEL) and single event burn-out (SEB) robustness in heavy ion environments. Both the devices are radiation assurance tested to 100krad(Si) at high dose rate and 75krad(Si) at low dose rate. In addition, Renesas’ innovative floating design let users create a current source or sink with no ground connection. The ISL70591SEH and ISL70592SEH radiation-hardened precision current source ICs are available now in 4-lead CDFP packages or in die form.